Though the official conclusions are still months away, the evidence is mounting that last week's crash of Asiana Airlines Flight 214 at San Francisco International Airport resulted not from any mechanical or equipment failure, but from pilot error. And as NBC's Mike Taibbi reports, the disaster has claimed a third victim. >>> there is news tonight in the investigation of crash of asiana flight 214 which is unfolding anthony broadcast a week ago tonight. officials have finished clearing away the plane's wreckage. the runway is back home. we get more from mike taibbi . >> reporter: runway 28 left after the wreckage of asiana flight 214 was removed and after a third victim a 16-year-old teen whose family asked for privacy succumbed to her injuries. >> it's a very sad day here. we've all done everything we could to take care of this young lady . >> reporter: it was one week ago today that the asiana air boeing 777 slammed a seawall on approach snapping off one engine and also the mainlanding gear. ntsb chairman said the aircraft's equipment was in working order. >> there's no anomalous behavior of the pilot, director or auto throttles. >> reporter: the pilots cleared to hand fly on visual approach were confused in the final seconds. >> first, about being above the glide path , then about being on the glide path , and then later, about being below the glide path . >> reporter: about the pilots, a san francisco television station on friday not only misidentified them but did sign a humiliating way. they fell for a prank and announced names for the cockpit crew that were false and racially insensitive. >> captain sum ting wong, wi wi tu lo. >> we made several mistakes. first of all we never read the names out loud. 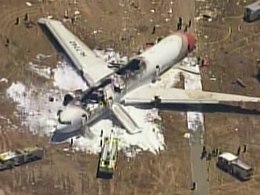 >> reporter: lessons learned one week later from a tragedy from dozens of passengers and cost three lives. mike taibbi nbc news, los angeles .